Contractors are the hardworking, creative and innovative members of Elfpack who have constructed and created an official page, and/or have drastically improved an existing official page. 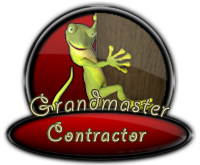 Grandmaster Contractors are the amazingly hard working and dedicated people who have created and constructed countless official pages, and have put enormous time into improving existing official pages. Anyone can submit a new, wannabe official page on the Contractors office; no crew experience needed! If the page is helpful and benefits Elfpack, it will be officialized and you will become a Contractor. 2005-05-12 [Orestez]: are you refering to the you know your an Elfpack addict if... wiki? 2005-05-17 [Solitiaum]: You must suggest it on the suggestion page... Forgot the link... Elfpack Reccomended? 2005-05-23 [~*spawn*~]: Whee! Congrats, Dwemer. 2005-05-23 [Dwemer]: thanks a million love ^_^ Wow, spawny is a custodian! 2005-05-23 [Dwemer]: And a spider and a pinq! 2005-05-23 [Dwemer]: Go to artists and follow the link to donation something please! 2005-05-23 [Dwemer]: ^_^ How manages EG when you're not around ? 2005-05-23 [Dwemer]: Btw, would you care to vote on my wiki as best wiki ? 2005-05-23 [Dwemer]: ^_^ great, please olso look at the pet contest, but choose fair ^_^ we don't want to have any problems!